Michael Faraday was a British scientist who lived from September 22, 1791, to August 25, 1867. Faraday remains famous for the discoveries in electromagnetism and electrochemistry. Because of his discoveries, he is often called the Father of Electricity. Michael Faraday’s inventions ultimately changed the world and led to many technologies used today. Michael Faraday was a prolific chemist and physicist who worked in the 19th century in Great Britain. Faraday invented or developed many items and methods, including the electric motor, transformer, generator, Faraday cage and many other achievements. Why Is Michael Faraday the Father of Electricity? Because of his work, Michael Faraday is called the Father of Electricity. Many also consider him the Father of Electromagnetism. This is because Faraday discovered electromagnetic induction, and he found a way to convert magnetic force into electrical force. Faraday’s work would go on to inspire others to follow in his footsteps, forever changing the world. Where Did Michael Faraday Do His Work? Michael Faraday was a thorough and curious investigator who arose from humble beginnings. His father was a blacksmith, and Michael had many siblings. This meant his initial education was mundane. His work at age 14 under a bookseller and bookbinder exposed him to many books and enabled him to educate himself on many topics. He grew fascinated with electricity, magnetism and chemistry. In fact, Faraday’s first known experiment was a chemistry experiment in which he decomposed magnesium sulfate. He also worked on improving steel alloys. In 1823, Faraday liquefied chlorine gas for the first time. In 1825, he discovered bicarburet of hydrogen, now known as benzene. Faraday greatly admired the work of chemist Humphry Davy at the Royal Institution of Great Britain in London, England. The Royal Institution served as a means to promote education in Britain. Faraday recorded extensive notes from Davy’s lectures, and offered them to Davy. Davy was sufficiently impressed, so much that he eventually allowed Faraday to study with him. At first, Faraday worked on rudimentary laboratory tasks. Davy and his wife took Faraday with them on a tour of Europe, where Faraday was able to learn about scientific luminaries. This opened Faraday up to new connections and inspired his works. Faraday made several important discoveries while working as a chemist for the Institution. He also worked on optical glasses and alloys. Faraday conducted most of his experiments there, where he became a prominent lecturer in his own right. Faraday wrote meticulous notes that described his experiments in great detail. These notes can be read today and understood because of the skill he placed in both his work and his writing. One thing to realize is that Faraday was not skilled in mathematics, which makes his discoveries and inventions all the more remarkable. It would take James Clark Maxwell, a theoretical physicist and mathematician, to follow in Faraday’s footsteps and build upon Faraday's work. Maxwell used mathematics to test and prove Faraday’s discoveries, fully fleshing out electromagnetism. While Faraday did not have the knowledge of atomic particles that would be discovered decades later, he did make some intriguing notes. He speculated about the behavior of metals carrying induced electric current. He even went so far as to postulate there might be particles of matter in electrical arrangements, which could move. Basically, he was describing electrons without realizing it! What Did Michael Faraday Invent? Faraday made a number of scientific discoveries that led to both his own inventions, and to many other technological innovations over time. Michael Faraday’s inventions include the transformer, the electric motor, and the electric dynamo or generator. His discoveries range from chemical to physical to electromagnetic in scope and subject. When Faraday was 20 years old, he discovered electrolysis. He did this by separating magnesium sulfate solution components using simple parts such as zinc and copper disks and an electric battery. From this, Faraday established the two laws of electrolysis. The first law entails that for a given solution, the amount of matter deposited on electrodes is directly proportional to the amount of electricity that passes in solution. Ions that carry charge through a solution must therefore have a well-defined charge. Additionally, the amounts of electrically deposited or dissolved substances are proportional to their chemical weights. The higher the valence of ions, the higher the charge must be. While Hans Christian Oersted had found that electric current could be converted to magnetic force, it was Faraday who proved electricity could be produced from magnetism. As early as 1821, Faraday produced a device made out of a magnet with a chemical battery and a wire, which spun around the magnet. He described this as using both electricity and magnetism creating motion, building upon Oersted’s discoveries. This was the very first form of an electric motor. Faraday also made the first transformer. In 1831, Faraday first discovered electromagnetic induction. This describes an electric current that can be induced to flow through a conductor with a changing magnetic field. Faraday did this by making what was called an induction ring, which consisted of a non-magnetized iron ring with two coils of wire wound on opposite sides of it. He connected one coil to a battery and another coil to a galvanometer, and switched on the device. This caused the needle on the galvanometer to spin. This discovery forged a foundation for Faraday’s future inventions. Faraday also connected a rudimentary generator with a tube coiled with wire and insulated with cotton, and passed a bar magnet over the wire. This moved the galvanometer needle, revealing flowing electric current. Faraday had found at last found the means to convert magnetic force to electrical force, with continuous electric current. This served as the precursor for his electric dynamo or generator. Michael Faraday’s inventions also included methodologies. One example is cryogenics, which began in Faraday’s lab in 1823 when he produced sub-freezing temperatures. In 1836, another Michael Faraday invention, the Faraday cage, came into being. A Faraday cage is a manmade structure that shields sensitive experiments from electromagnetic radiation. Faraday first made such a “cage” by lining a room with metal foil. He then used a generator to bombard the room with electricity. The metal of the foil conducted current on its surface, creating a neutral area within the room. A Faraday cage is protective against electrical charge as well as electromagnetic waves. Today, these structures can be tailored using different kinds of materials to block out different kinds of electromagnetic waves, including radio, X-ray or other frequency waves. Faraday differed from his contemporary scientists with his approach of using iron filings to visualize a magnetic field with lines of force. He also thoroughly studied what he called dielectric materials, or what today are called insulators. Faraday even worked on the relationship between gravity and electricity. He experimented with the transmission of light through solutions. In 1857, Faraday prepared what he called “activated gold,” in which he used phosphorus to make a sample of colloidal gold. Michael Faraday worked on so many experiments, both in physics and chemistry, that he left a tremendous legacy in science and in everyday life. How Did Michael Faraday Change the World? Faraday is indeed the Father of Electromagnetism; his discoveries led people to pursue technology that used electromagnetism. Faraday's work was the springboard for endeavors in magnetic fields, mechanical motion and electric current. Other researchers and inventors ran with his ideas, attempting to find ways to put them to practical use. Another discovery of Faraday’s was a phenomenon in which the polarization plane of light waves is affected by an applied magnetic field. This rotation of the light plane across a glass surface is now called the Faraday effect or Faraday rotation. This demonstration led to the initiation of microwave technology and various technologies in communication. One groundbreaking and immediately profound result of Michael Faraday’s discoveries was the invention of the telegraph. 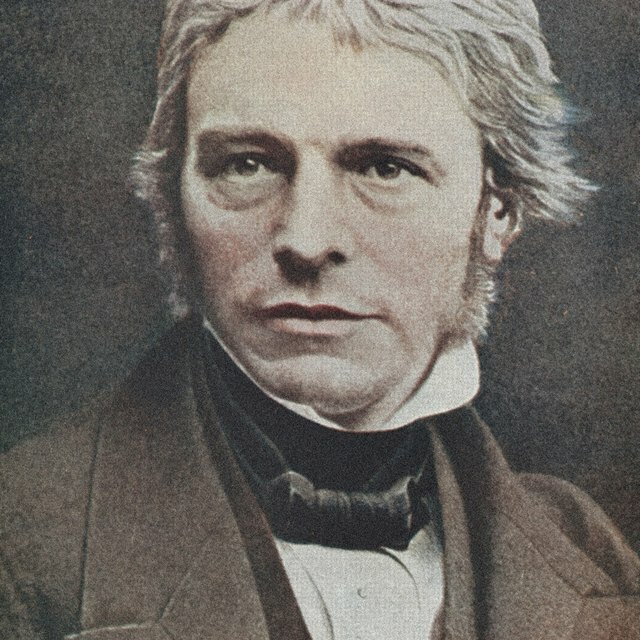 While Faraday himself did not invent the telegraph, his work contributed to its conception. This made possible, for the first time, worldwide communication in a short period of time. Faraday’s generator discovery led to applications that aided sailors at sea. A British lighthouse became the first in the world in which electricity was used to power the light. This generator was a descendent of Faraday’s original invention. Electric-powered lighthouses would be come the standard in the years to come. He and chemist John Danielli worked on the terms used in electrochemistry. Faraday came up with the words "ion," "cathode" and "electrode." It is hard to imagine that those terms were conceived of in the 19th century as they have been so important and prevalent in the 20th and 21st centuries. Today, even Michael Faraday’s name is honored as a unit. The farad – no "y" at the end – is the term used for electrical capacitance. The electric power used around the world relies upon Faraday’s discoveries and inventions almost two centuries ago. All energy sources still rely on a generator to produce the electrical current that powers everything people use. The next time you see a hydroelectric dam or a steam plant, remember the contributions of Michael Faraday. With his great attention to detail, limitless curiosity and desire to educate others, Michael Faraday left an indelible mark on science in general. Look around your home and outside, and you will find something that Faraday lent his lifelong work to in some way. Michael Faraday, as Father of Electricity and Electromagnetism, changed the world for the better. How Did Thomas Edison's Light Bulb Work? Who Invented the Circuit Breaker? Dianne, J.. "Things Michael Faraday Invented." Sciencing, https://sciencing.com/things-michael-faraday-invented-17973.html. 14 November 2018. What Contributions Did J.J. Thomson Make to the Atom?